moments of perfect clarity: stoned. in a good way. stoned. in a good way. a few weeks ago, trinsch of the lovely, carefree hairstyle fame (which i am too uncoordinated to duplicate, by the way, tho' i tried), had a corner view: the beach post which had some really beautiful stones in it. there was a picture of them lying in their natural state in the sand and then in a beautiful little stack. i asked her to upload that little stack to flickr so i could favorite it, because you know i have a totally minor and not at all requiring meds or excess baggage fees thing about stones. happily, she obliged and i was content. and then, today, a little envelope arrived in my mailbox. fabulous handwriting! cool stone with a hole in it! could it get any better? why yes, it could! inside the pretty little bag were those very stones trinsch gathered on the beach in israel! how awesome is that? but wait, it gets even better. that little white stone at the bottom (at 5:30) is a little piece of marble. trinsch says that it's from the historical site of caesarea--the ruins of a roman city--2000 years old. italian marble, washed and rounded and smoothed in the sea for hundreds of years, washes up on the beaches in israel, near the historical site. but my very favorite one is the little round grey one right beside it (at 7:30)--it's smooth and perfect. from trinsch's picture, i imagined that the stones were larger (tho' husband made fun of me for that, asking how large i imagined the bits of sand were), but i am madly in love with them and not the least bit disappointed that they are small--they're absolutely perfect! than you so much, trinsch, for making my monday! in fact, i'm sure it will actually make my whole week! today, trinsch has a lovely post featuring a typecase from her childhood where she displays stones and shells found on beaches around the world. you should go have a look at it, it will make your monday less weird, i promise. perhaps someone will send you some wine. :-) or proper tequila. I agree. People should send me wine, tequila and some Starbucks coffee. I thikn I have expressed sufficient interest for said products. Perhaps? very cool stones. I never thought about them before so I guess I will have to add that to my list of things to work on. I agree with dixie and ext, I'll take stacks of any of the above. Lovely lovely stones. 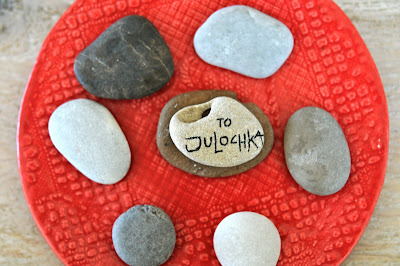 You'll soon have baskets of stones in every room of your home, labeled to remember where they all came from! It a darn good thing you don't live on a houseboat. very cool! i tend to collect stones and shells myself. maybe i should state that more often if i want ones shipped to me from exotic locales? Great pics! Tha ks for sharing. 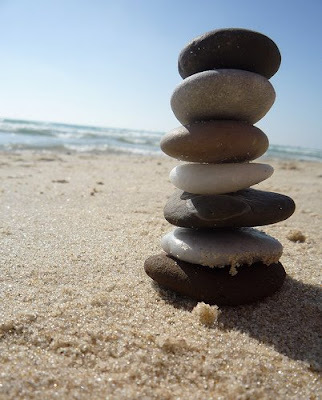 Great thought... the stone by mail :) and the pic of the beach is really beautiful! I have to think about collecting something!! oh, your photos of them are so great! i am so excited to see them in their new home. trinsch - So I take it you wont be mailing me alcohol...? Oh my goodness, what wonderful images...and what a present. I'm sure you've got a smile a mile wide today. So thoughtful and kind! There is something almost spookily exciting about receiving stones from the other side of the world. To make "concrete" the fragile bonds of words . . .
What a lovely, lovely thing to do. I swear your comment box is almost as fun if not more fun then your posts! I am always laughing at the back and forth. as far as proper alcohol - Minnesota is not the place for this to come from. How fantastic! A very thoughtful gift. don't forget! big petroglyph giveaway tomorrow!